Auto Insurance. This is capable of protecting policyholders against financial losses in case of incidents like traffic collision that may cause damage to their vehicles. Its coverage typically includes property coverage for car damages or theft, liability coverage in case you are legally responsible to others for property damage or bodily injury and medical coverage which covers for the cost for rehabilitation, treatment of injuries, funeral expenses and lost wages due to a car accident. Home Insurance. It provides coverage for destruction or damages on your home. Health Insurance. This covers for the total cost of health or medical treatments. Life Insurance. It offers monetary benefits to your family or designated beneficiaries in case of your untimely demise. If you want to become a certified insurance agent and familiarize yourself about all the different types of insurance, then deciding to enroll in the insurance certification program offered by Brainmeasures can do you a lot of good. With the help of the insurance course from Brainmeasures, you get the chance to understand all the different types of insurance and how it can benefit specific individuals, professionals and business entities. The certification course offers a well-detailed and highly comprehensive insurance training which makes it possible for you to understand the major concepts used in the field while also allowing you to gather information about selecting the most suitable type of insurance coverage for specific people and professionals. 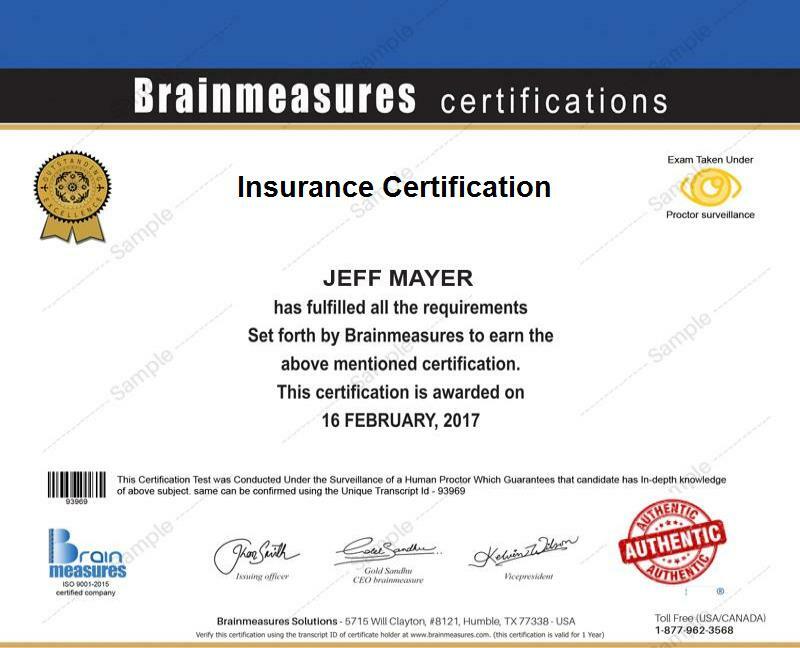 It should also be noted that the insurance certification program offered by Brainmeasures comes with an online insurance exam which serves as the most effective way to evaluate the level of your understanding and skills about insurance. Passing this test allows you to finally receive your insurance certificate so working as a certified expert in the field will no longer become that hard. How to manage risks if you do not have an insurance coverage? How to avoid all the personal property pitfalls for homeowners? The insurance certification program which is now offered by Brainmeasures works in helping a wide array of individuals and professionals especially those who are working in the insurance industry. The certification program is most suitable for insurance agents, financial planners, employee benefits specialists, retirement planners and any other insurance professionals who need to completely understand how different types of insurance work and in delivering and determining the most suitable coverage for various individuals. Being able to complete your insurance certification course is extremely useful when it comes to significantly increasing the level of your income. If you work as an insurance service representative, then this profession will allow you to start earning around $22,000 to $50,000 per year. Working as an insurance sales agent is also proven to be extremely profitable. This career allows you to earn a salary within the range of $42,000 to $150,000 annually.